Pines View Hotel on top of Baguio City with an awesome view! Pines View Hotel have you been yet? 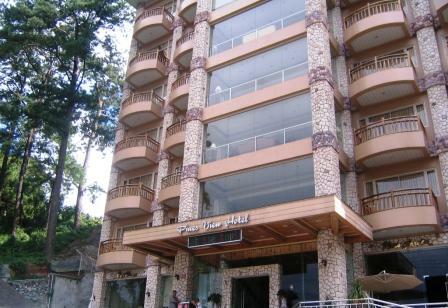 The Pines View Hotel will bring you one of the most breathtaking panoramic views of downtown Baguio. This is the place to experience top class service for a four star hotel. Each of the hotel’s floors has a lobby with big glass windows where you can see most of the city. The view from the top floor is incredibly spectacular, especially at night time. As you enter the Pines View, you will notice the lush landscaping and if you take a closer look you will notice how meticulous the gardener or landscaper has been. The hotel’s courteous and attentive staff will greet you and be ready to accommodate you and provide well-organized and fast quality service – no hassle check-inn’s here. They treat every guest, big or small, as if you are the only guest in the hotel. The hotel has 58 comfortable and spacious rooms with complete amenities and decorated with framed antique collections. The rooms look brand new as the hotel was recently built. All rooms are equipped with free Wi-Fi internet access, cable TV and mini-bar. Also, it includes: IDD/NDD telephone services, 24-hour hot and cold water, and built-in hair dryer. Room and laundry service is fast and efficient. And if you have two children 10 years and younger, they are absolutely free to share your rooms. 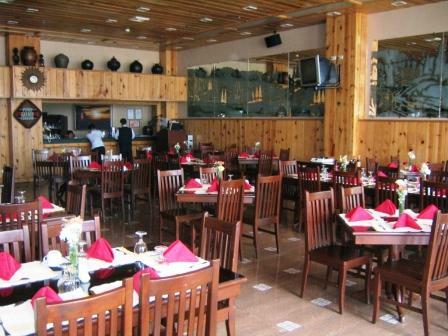 .Here you can dine with authentic Chinese and international cuisine. They serve breakfast, lunch and dinner. Sometimes, Café Roma has a pianist playing some tunes while you eat and drink cocktails. Most hotels do not offer free breakfast, this one does on your check in. They also have a function hall for special events. It seats 100-300 people with complete banquet facilities. As a theatre set-up, it can fit in 500 persons. It is also ideal for meeting seminars, presentations, weddings and special occasions. They also have the Bea Hall for smaller gatherings. Where is the Pines View Hotel? 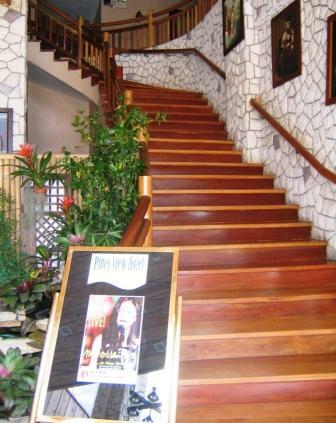 The hotel is conveniently located at 24 Legarda Road, right alongside with the city’s best nightspots. This is good particularly if you are into heavy partying at clubs. Popular clubs are only a walking distance away from Pines View. Iit only takes 7 minutes by cab to get to the hotel from the city bus terminal. The hotel has a stand-by generator in case of power failure, automatic fire sprinklers in every room and automated fire alarm system. Security is tight and there is close circuit monitors and a 24-hour security service. Room rates vary from US$35 to 110. They have Economy, Single Standard, Twin Standard, Single Deluxe with Veranda, Double Deluxe with Veranda, Junior Deluxe, and Family Deluxe suites. The penthouse suite even has a fireplace of its own to warm you up in the coolest of the night. The rates are on a per room per night basis. Is the Pines View Hotel worth the money? The Pines View Hotel is recommended for tourists who have a bigger budget, but not too much. The Pines View Hotel is definitely value for your money.